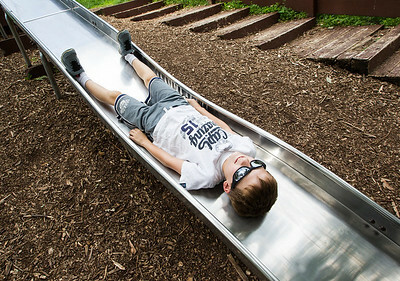 Sarah Nader- snader@shawmedia.com Jake Satalino, 9, of Algonquin slides down on his back while playing at Deicke Park in Huntley Friday, June 19, 2015. 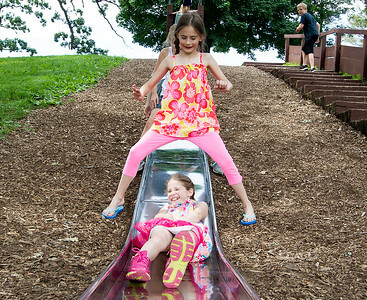 Sarah Nader- snader@shawmedia.com Carrie Willig (bottom), 8, of Algonquin slides under Maggie Mitchell, 7, of Algonquin while playing at Deicke Park in Huntley Friday, June 19, 2015. 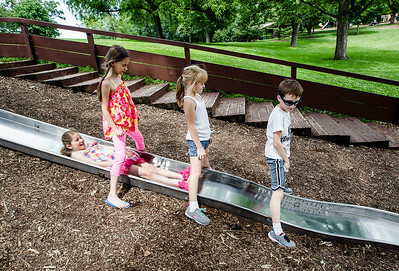 Sarah Nader- snader@shawmedia.com Carrie Willig (left), 8, of Algonquin slides under Maggie Mitchell, 7, Elaina Satalino, 8, and Jake Satalino, 9, all of Algonquin, while playing at Deicke Park in Huntley Friday, June 19, 2015. According to the National Weather Service temperatures are expected to be in the mid 80's throughout the weekend. 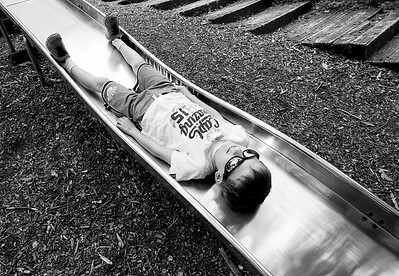 Jake Satalino, 9, of Algonquin slides down on his back while playing at Deicke Park in Huntley Friday, June 19, 2015.